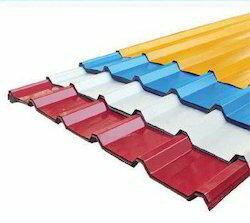 Our company has mastered the art in offering Color Coated Aluminium Roofing Sheets to the clients. These products are made using quality passed material and cutting-edge machines as per set industry parameters. Offered range is admired across the country for various characteristics like long functional life, high tensile strength, corrosion resistance and smooth texture. 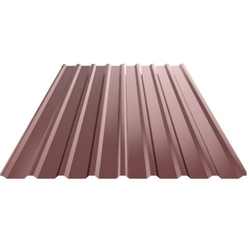 Color Coated Aluminium Roofing Sheets are widely used in numerous applications such as ceilings, airplane wings, car bodies, medical tables and many others. These products are widely appreciated by clients. Our company has achieved laurels in offering Pre Painted Aluminium Roofing Sheets to the clients. These products are manufactured using the finest quality raw material and latest technology in compliance with industry quality standards. These products are widely demanded in the market due to easy installation and long-lasting shine. The offered range is well designed at sound production unit by making use of premium grade material. Pre Painted Aluminium Roofing Sheets are well-known for an excellent physical property, light-weight, high durability, exceptional tensile strength, and sturdiness. With a shiny finish and the non-rusting nature of Aluminium, here we readily provide a wide range of Bare Aluminium Roofing Sheets. Longer durability and rust free property of Aluminium gives this Industrial age a new way to cover their works and units. Superior-grade aluminum is utilized in the manufacturing process of these products that are resistant to corrosion and is durable in nature. Further, these are available in all grades and industrial trapezoidal profiles. Our company is widely appreciated in offering Pre Coated Aluminium Roofing Sheets to the clients. These products are best suitable for various industries or applications such as warehouse, marriage and function hall, auditorium, foods and agro-industries, sugar industries godown etc. The offered range is acknowledged by valuable clients for rugged construction, easy installation, and longer lifespan. Pre Coated Aluminium Roofing Sheets are designed and manufactured at well-equipped production unit under the stern supervision of experts by utilizing the finest quality raw material. Looking for Aluminium Roofing Sheets ?